Did you know? Mars is closest to Earth every 26 months. In fact, many Mars missions have launched every two years or so, which coincide with the Mars Close Approach. It’s easier to get to Mars when Mars is closest! Makes sense, huh?! On July 31st, Mars will be the closest to Earth it has been for 15 years! Mars has been getting closer and brighter in June and through July, and it will appear the brightest from July 27th to July 30th. On July 31st, 2018, Mars will be only 35.8 million miles (57.6 million kilometers) from Earth! 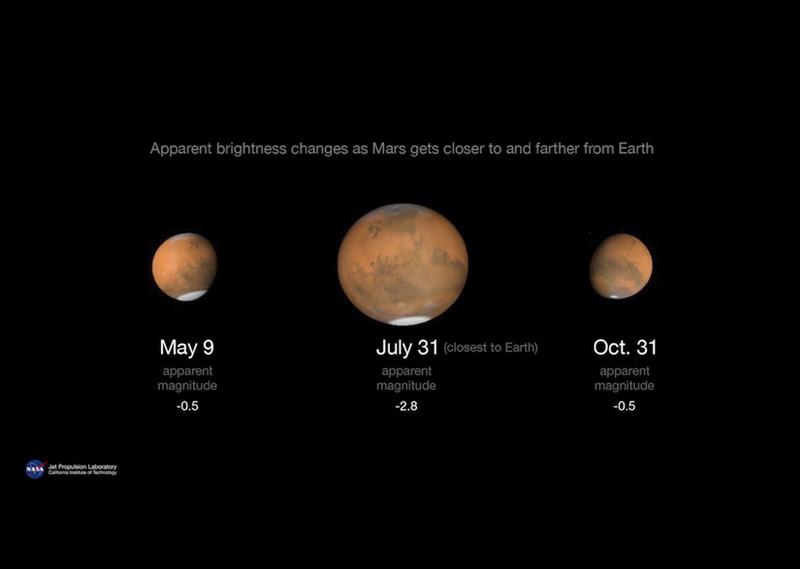 Throughout August, Mars will become fainter in the night sky as we part ways again. The next Mars Close Approach will occur on October 6th 2020, but will not be quite as close (38.6 million miles away). The distance between the two planets is determined by their orbits. If they both orbited the sun in perfect circles, their minimum distance would always be the same. However, they both have elliptical (oval) orbits. Get your eyes on the night sky and try to see Mars for yourself. It will be visible most of the night, about 35 degrees above the southern horizon (or about 1/3 the distance between the horizon and directly overhead). If you get lucky enough to snap some pictures of this bright planet, please upload your pictures to the comments section of the blog. Or just share your story of how you spotted Mars for yourself. Naked eye? Telescope? What did you use and how did you find it? Due to a late-arrival flight, I finally stayed up long enough to see the Mars close approach! It seemed like the brightest star in the sky to me. Compare the brightness to the moon! A little blurry but neat with the clouds around the moon.